Function: Opens the chest and rectifies Qi, suppresses cough and calms dyspnea, diffuses the Lung and clears heat. Function: Opens the chest and rectifies Qi, nourishes the Heart and calms the spirit, quickens the blood, transforms stasis, relieves pain. Function: Pacifies the Stomach, clears heat, cools blood, expels fire-poison, opens the orifices, stops convulsions, moves blood and dispels stasis, calms the mind. Indications: Cardiac pain, palpitation, febrile diseases, irritability, stomach ache, vomiting, pain in the elbow and arm, tremor of the hand and arm. Function: Removes obstructions from the channel, stops pain, calms the Heart, opens the chest, regulates blood, cools the blood, strengthens the mind. Indications: Cardiac pain, palpitation, epistaxis hematemesis, hemoptysis chest pain, furuncle, epilepsy. Function: Resolves phlegm in Heart, regulates Heart Qi, opens chest, regulates Stomach heat. Indications: Cardiac pain, palpitation, stomach ache, vomiting, febrile diseases, irritability, malaria, mental disorders, epilepsy, swelling of axilla, contracture of elbow and arm. Function: Opens the chest, regulates Heart Qi and blood, regulates and clears the Triple Energizer, calms the mind, regulates the terminal yin, harmonizes the Stomach. Indications: Cardiac pain, palpitation, stuffy chest, pain in the hypochondriac region, stomach ache, nausea, vomiting, hiccups, mental disorders, epilepsy, insomnia, febrile diseases, irritability, malaria, contracture and pain in the elbow and arm. Function: Calms the mind, clears heat. Indications: Cardiac pain, palpitation, stomach ache, vomiting, mental disorders, epilepsy, stuffy chest, pain in the hypochondriac region, convulsion, insomnia, irritability, foul breath. Function: Clears Heart fire, calms the mind. Indications: Cardiac pain, mental disorders, epilepsy, gastritis, foul breath, fungus infection of the hand and foot, vomiting, nausea. Function: Clears heat, restores consciousness, expels wind. Indications: Cardiac pain, palpitation, loss of consciousness, aphasia with stiffness and swelling of tongue, febrile diseases, heat stroke, convulsion, feverish sensation in the palm. The pericardium is described in Chinese medicine as the protector of the physical heart and has the primary function of protecting the heart from pathogenic attack. You may notice that most of the primary meridians represent a physical body organ, but not the Pericardium meridian. 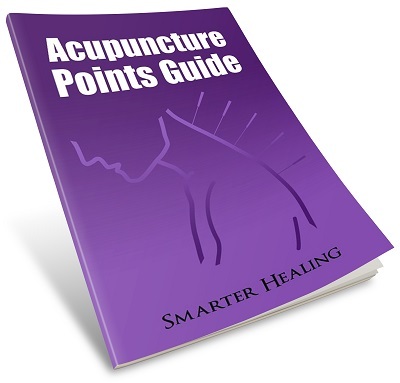 In the oldest acupuncture texts, the Pericardium was not considered an independent organ, but was merely an extension of the Heart organ. With the Pericardium sinews around the meridian being closely connection the physical heart, the Pericardium meridian is often used to treat heart disorders. Treats problems with the physical heart, such as palpitations, pain, or irregular heart rhythm. Treats disorders of the chest in general, including lung problems. Used to restore energy to the upper or middle energizer portion of the Triple Energizer meridian. Treating disorders of the stomach, especially those related to the middle energizer of the Triple Energizer meridian. Treating problems in the lateral costal region (side of the chest) in which the Pericardium sinews reside. Treating any pathogenic diseases which can cause a fever, especially pathogens that might infect the physical heart. Treating physical pain, swelling, and soreness of the axilla (shoulder joint area) through which the Pericardium sinews pass. 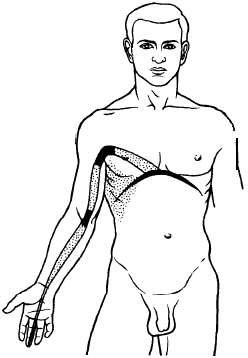 The Pericardium meridian starts at the tip of the middle finger and runs along the arm and onto the chest. Like all meridians, the Pericardium is not just a straight line of energy, but also has a layer of sinews (muscle tissues) that surround it, as well as other pathways of energy that flow into and out from it. Along the pathway of the meridian line lies the Pericardium sinew channel. These sinews are the tissue that encompass the flow of energy through the meridian up the arm and onto the side of the chest, and into the center of the chest as well. 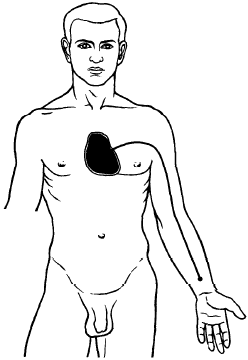 Once they reach the center of the chest, the Pericardium sinews split sideways as seen in the image linked to earlier and join up to the diaphragm. This particular section is why the Pericardium can be used to treat lung and chest problems, since the energy from the meridian also flows into that area of the body. Another aspect of the Pericardium meridian is the Pericardium divergent channel which goes up the center of the body and onto the face, where it comes to an end behind the ear. It is behind the ear that the divergent channel connects to the Triple Energizer meridian, near the point TE17. The Pericardium also has the Pericardium luo-connecting channel which mostly just follows the pathway of the regular Pericardium meridian line, starting at P6 on the arm and travelling next to the meridian line until it reaches the physical heart. 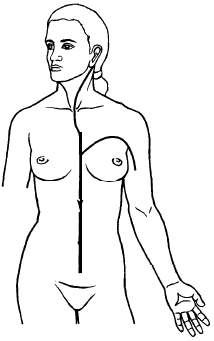 The Pericardium meridian also has an unnamed connection which branches off from acupoint P8 on the hand and connects to the nearby point TE1 on the Triple Energizer meridian.